Italian journalist dies of wounds sustained in attack in Strasbourg Christmas market earlier this week. 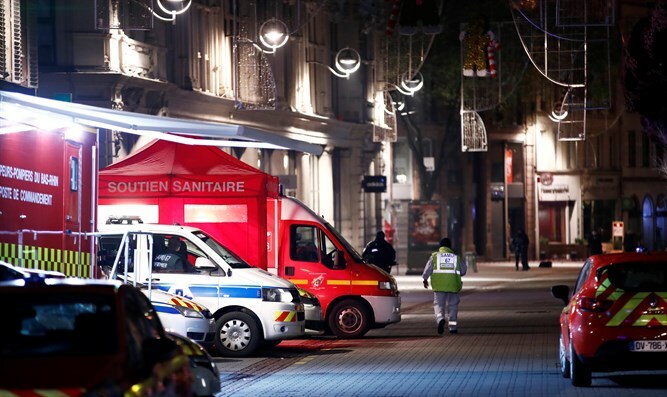 The death toll in the terrorist attack at the Strasbourg Christmas market rose to four on Friday, when a person died as a result of wounds suffered in the shooting. "The person had been fighting for their life," an official in the Paris prosecutor's office said, according to euronews. Italian Premier Giuseppe Conte said the fourth victim was a young Italian journalist who was badly wounded in the shooting, The Associated Press reported. On Thursday, French authorities shot and killed the terrorist who carried out the attack, Cherif Chekatt. He was spotted leaving a building in the Neudorf area of the city, where he lived. After firing on police, he was killed as they responded. After Chekatt was eliminated, the Islamic State (ISIS) jihadist group claimed responsibility for the attack, saying in its propaganda news agency Amaq that Chekatt was an ISIS "soldier" who "carried out the operation in response to call to target citizens of the international coalition." Strasbourg reopened its Christmas market on Friday under heavy security measures, according to euronews.